The first Eastern Partnership European School opened in Tbilisi, Georgia on September 4. 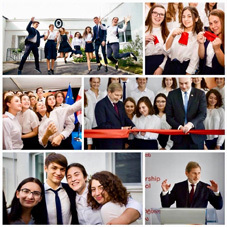 European Union Commissioner, Johannes Hahn and Prime Minister of Georgia, Mamuka Bakhtadze opened the First Eastern Partnership European School in Tbilisi. The school will provide students from the EU's Eastern partner countries with an innovative academic program while fostering multicultural exchanges and cooperation. Bakhtadze thanked the Europe Union (EU) for the implementation of the said project. Johannes Hahn, Commissioner for European Neighborhood Policy and Enlargement Negotiations, noted that school's opening is proof of the determination to implement the 20 deliverables for 2020, which will bring tangible benefits to citizens. “I'm very proud to be in Tbilisi today to open the first Eastern Partnership European School. It is a project close to my heart and marks a new milestone in the EU's cooperation with its Eastern partners,” he said. He also noted that 2000 young people expressed their desire to study at school, out of which, 30 were selected. The unique diploma program offered at the Eastern Partnership European School combines academic excellence with specialized teaching inspired by the European school system. During the Eastern Partnership Summit 2017, the Eastern Partnership European School was endorsed as a top priority by all EU Member States and the six Eastern partner countries. The Eastern Partnership (EaP) is a joint policy initiative that aims to deepen and strengthen relations between the European Union (EU), its Member States and its six Eastern neighbors: Armenia, Azerbaijan, Belarus, Georgia, the Republic of Moldova and Ukraine.